LONG-LASTING FAUCET FILTER LIFE: Compared with most tap water purifier on market, our ACF faucet filtration system is characterized by a superior long filter life. 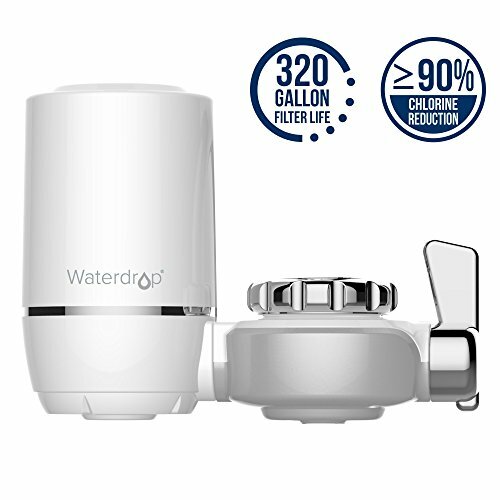 Each filter delivers 6 months or 320 gallons of clean and fresh water, 3 times longer than many other water filtration faucet. FIVE-STAGE FILTRATION TECHNOLOGY: To create ultimate clean water, our faucet mount filter adopts the latest, upgraded Activated Carbon Fiber (ACF). This healthy faucet water replacement filter is able to effectively inhibit the bacterial growth and reduce chlorine and other contaminants. FAST & STABLE FLOW RATE: Our tap water filter system is featured with outstanding 0.5 GPM Hi-Flow design, allowing for instant access to large amount of filtered water. 4 water bottles (16.9oz) can be filled within 1 minute. ERGONOMIC DESIGN: Simple switch lever allows quick switch from quality filtered water to regular tap water. The faucet also features space-saving design. You can equip the tap water purifier for kitchen and bathroom, making it easy for facial cleansing and cooking. HASSLE-FREE INSTALLATION: The filtered water faucet adopts leak-proof technology and can be attached to your faucet very easily. **This faucet filtration system fits standard faucets. Does not fit pull-out, hand-held or spray style faucets. Please verify if our product suits your faucet before the purchase.